The Best Anorexia blogs from thousands of top Anorexia blogs in our index using search and social metrics. Data will be refreshed once a week.Also check out Top Anorexia Youtube Channels list for Top videos on Anorexia. 2.15 .:Too Much, Not Enough:. 2.16 R is for Recovery (and Rebekah) | Recovering Anorexic finding Freedom in Christ. Anorexia newsletter is a comprehensive summary of the day's most important blog posts and news articles from the best Anorexia websites on the web, and delivered to your email inbox each morning. To subscribe, simply provide us with your email address. UK About Blog Boys get eating disorders, too, just like girls. In 2009 Bev Mattocks Osborne's 15-year old son developed anorexia. Now, aged 23 and studying for a Masters Degree at university, he is thankfully recovered. This blog is her story. Bev is a 57-year old freelance copywriter lives in Yorkshire, UK. Facebook fans n/a. Twitter followers 28. About Blog This blog chronicles the author journey from severe anorexia to recovery and every twist and turn along the way. The blog posts are meant to be read from beginning to end, as a book. This blog is for parent or loved one of someone suffering with an eating disorder. Perhaps you’re in the throes of anorexia yourself. Facebook fans 1,046. Twitter followers 1,329. Colorado About Blog Eating Disorder Recovery for Adults information, blog, podcast and resources from recovered adult sufferer Tabitha Farrar. Facebook fans 842. Twitter followers 2,457. Chicago, IL About Blog The ANAD blog contains articles on eating disorder awareness, prevention, recovery, and more. Check back often for new information. Facebook fans 13,417. Twitter followers 5,149. Austin, TX About Blog Mommy-strong.com is a place where people can find support for eating disorder recovery, specifically anorexia, including: resources, music, reading, ted talks, and my personal story/blog. Facebook fans 221. Twitter followers 2. Denver, CO About Blog Blog about all The Truths About Eating Disorders, Rehab, and Recovery by Lindsey Hall, a PCOS Warrior and a Day-time Publicist. Facebook fans n/a. Twitter followers 635. About Blog Hannah, 17, SE England and recovering from anorexia nervosa, anxiety and low mood. About Blog This blog is a journal of sorts as I go through recovery from anorexia, depression, and anxiety. It may get triggering at times or get very personal because this is an outlet for how I’m feeling. This is the authentic version of me. About Blog This blog is a place for me to vent and talk about life with anorexia, depression and PTSD, that I hope one day I will soon recover from. Recently discharged from an ed unit so please read with caution. Essex About Blog Rebecca Quinlan's aim is to talk about the little things that make a BIG difference for those who are suffering or have suffered from Anorexia. Facebook fans n/a. Twitter followers 112. Northamptonshire About Blog I'm a 20-year-old University Student who's interested in Mental Health. I've suffered from Mental Health Disorders for most of my life but more severely in the last 7 years. I suffer from Depression, Anxiety, Panic Attacks, OCD and Anorexia Nervosa. My blog is all about my own journey with Mental Health, aiming to end the stigma and to inspire others to recover too. Facebook fans n/a. Twitter followers 65. Sydney, Australia About Blog Michelle Sparkes, Health professional, author, speaker, long term recovered survivor of anorexia and EDNOS. Her mission is to help the people struggling with eating disorders and disordered eating. Facebook fans 283. Twitter followers 179. Pennsylvania, USA About Blog Jennifer Kreatsoulas is a writer, yoga teacher, and a yoga therapist who specialises in eating disorders. She provide yoga therapy for eating disorders. The yoga for eating disorders program offers support for anorexia, bulimia, and binge eating disorder. Facebook fans 1,102. Twitter followers 697. About Blog A blog about my Anorexia recovery. Karly, diagnosed with Anorexia almost three years ago and have been battling it ever since. On her blog she shares different experiences and her recovery, to inspire people with eating disorders to fight for a happier and healthier life. 15. .:Too Much, Not Enough:. About Blog Isabella Rayne. 23 years old, from Australia. Apart from that, I'm just a bundle of diagnoses. 16. R is for Recovery (and Rebekah) | Recovering Anorexic finding Freedom in Christ. Australia About Blog This blog was started in October 2011 when I was recovering from Anorexia Nervosa and Bulimia Nervosa. I use this blog as a means of educating, communicating and putting eating disorders in perspective. R is for Recovery is also a Christian blog. Facebook fans 799. Twitter followers 88. Cincinnati, OH About Blog Dr. J. Renae Norton, Alternative to Inpatient Treatment. I am an eating disorder specialist in the areas of bulimia, anorexia, bulimarexia, binge eating disorder, BED, emotional eating disorder and obesity. Facebook fans 886. Twitter followers 14,522. United Kingdom About Blog A blog about anorexia authored by the Undulating Runner. About Blog Laura Collins Lyster-Mensh is a fierce activist as well as the mother of a daughter who once had an eating disorder. Even though her child has overcome her anorexia nervosa, Lyster-Mensh is still offering up her opinions on charities and organizations that support people with anorexia and other eating disorders. Facebook fans n/a. Twitter followers 3,571.
portlandia & corvegas About Blog Bridgette Thurber, 20 year old living in the Pacific Northwest, recovering from Anorexia. Shares her journey about recovery and treatment. Facebook fans n/a. Twitter followers 439. About Blog Meredith O'Brien recovered from anorexia and was enslaved to eating disorder for over 25 years and came out the other side. Now, full of hope and serenity, she write about it. Her main goals are to inspire hope for those suffering with eating disorders and to share concrete skills and tools that helped her to recover. New York, NY About Blog The founders of Project HEAL, Liana Rosenman and Kristina Saffran, met while undergoing treatment for anorexia nervosa. These two girls helped each other to reach full recovery and decided to help others achieve it as well. They founded Project HEAL to raise money for others suffering with eating disorders who want to recover. Facebook fans 36,848. Twitter followers 10,086. 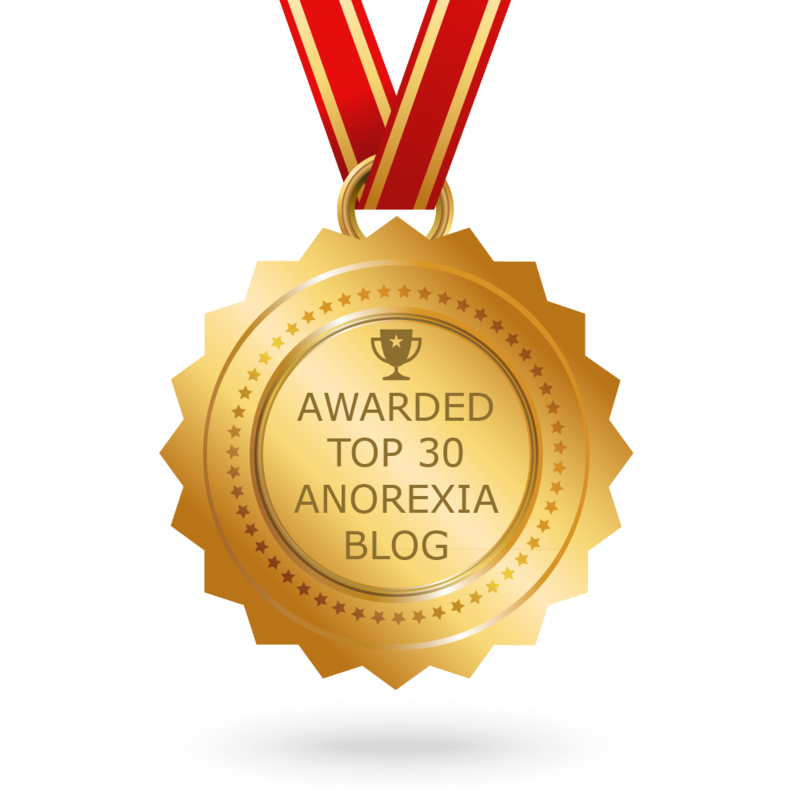 CONGRATULATIONS to every blogger that has made this Top Anorexia Blogs list! This is the most comprehensive list of best Anorexia blogs on the internet and I’m honoured to have you as part of this! I personally give you a high-five and want to thank you for your contribution to this world.